Back to basics for a minute. Built heritage conservation is not supposed to be about use (as long as there is a viable one of course!). So whether an old factory is used for its original industrial purpose, adapted for commercial use or turned into chic condos is all the same — right? 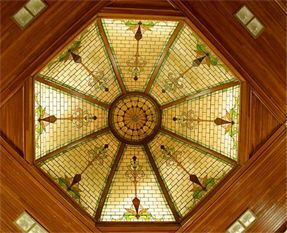 — provided its heritage features are identified and respected along the way. Heritage is about the fabric or “bricks-and-mortar,” the physical features of the place; while what takes place within/on that fabric/property — the way it is used — is pretty much irrelevant. This at any rate is the premise of our chief tools for legal protection — heritage designation and heritage easements under the OHA. They do not in themselves restrict (or permit) the use that can be made of a property or place. Zoning, our basic land use planning mechanism, does that. So continuing original use is almost always preferable to adaptive re-use. Why? Obviously it’s simpler, less complicated. Adaptive re-use involves, well, adaptation and intervention — physical changes which may have an impact on heritage attributes. But it’s more than that. Something else inevitably melts away when an old building is repurposed (as we now like to say) and its traditional use ends. Something intangible. Hard therefore to nail down, but having to do with a heightened sense of place, nearness of the past, consciousness of continuity. Sometimes we call this, rather inadequately I think, authenticity. Indulging the metaphor, this may help explain the reluctance of some faith organizations to save the “body” (the fabric) when the “soul” (the spiritual focus) of a building is no more. Unfortunately they sometimes choose to overlook the possibility that their place of worship could continue to serve as another group’s place of worship. For public policy, all this suggests that special measures should be considered to keep heritage places of worship as just that — places to worship — as well as to help overcome barriers to adaptive re-use when that’s not possible. What might these be? After many, many years of doing bubkas for churches, what was the spur for these provincial initiatives? Therein lies quite a tale… for next time. Note 1: The Appleton Charter for the Protection and Enhancement of the Built Environment, ICOMOS Canada (English-Speaking Committee), 1983. 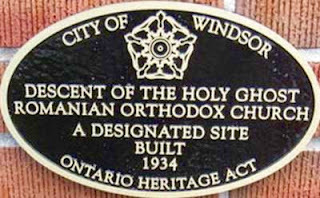 Note 2: The Ontario Heritage Act defines “heritage attributes” (a term used in the Act only in the context of heritage designation) narrowly: “in relation to real property, and to the buildings and structures on the real property, the attributes of the property, buildings and structures that contribute to their cultural heritage value or interest.” Use is not mentioned, nor does the word appear in the designation criteria in Reg. 9/06 and 10/06. By contrast, the non-legislative Standards and Guidelines for the Conservation of Historic Places in Canada takes a broader, looser approach, defining “character-defining elements” as “the materials, forms, location, spatial configurations, uses and cultural associations or meanings that contribute to the heritage value of an historic place, which must be retained in order to preserve its heritage value” (underlining added). Note 3: In the last 20 years the Quebec government has funnelled close to $300 million to the Conseil du patrimoine religieux du Quebec for the safeguarding of that province's religious heritage (both immoveable and moveable). 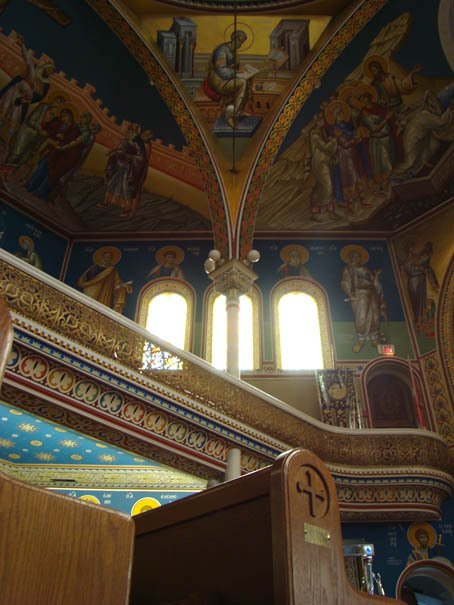 The last time the Ontario government had a grant program targeted to built heritage conservation, including churches, was the Heritage Challenge Fund of 1999-2001, which provided just five million dollars on a matching basis for the whole province. http://www.heritagetrust.on.ca/Ontario-s-Places-of-Worship/Home.aspx?lang=en-CA. The site includes a few case studies — with hopefully more to come — and some good links. 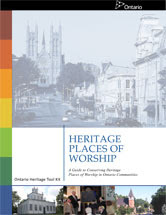 The ministry's guide, "Heritage Places of Worship: A Guide to Conserving Heritage Places of Worship in Ontario Communities", can be found at: http://www.mtc.gov.on.ca/en/publications/Heritage_Tool_Kit_POW.pdf. http://www.nationaltrustcanada.ca/sites/heritagecanada.org/files/National%20Places%20of%20Faith%20Roundtable%20Minutes.pdf. One of the most interesting presentations profiled Partners for Sacred Places, a U.S. organization that provides information and guidance to congregations and communities to sustain use of historic sacred places: http://www.sacredplaces.org.